We take in animals of any kind - but predominantly dogs that other rescue centres cannot take, including ex-bait and ​ex-fight dogs, the sick, the aged and the terminally ill. They come to us for rehab and either go to new homes or remain with us for life. Some just come to us for peace and love before they die, after a life of neglect and abuse. No animal is ever destroyed because they cannot be homed. 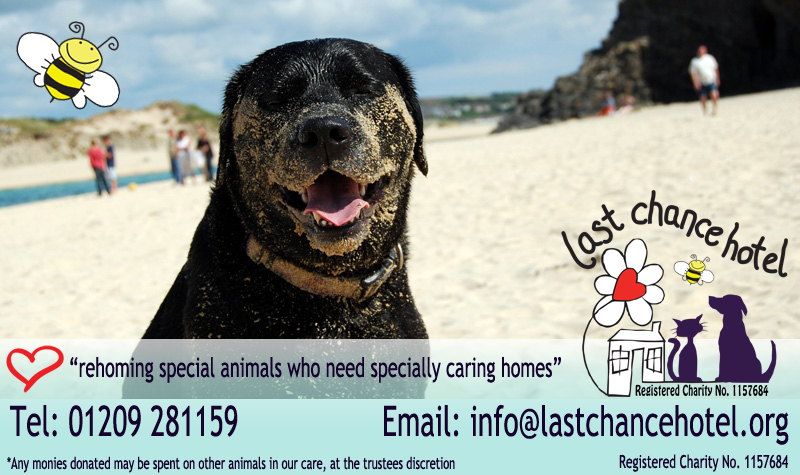 ​We are always looking for long and short term foster homes within Cornwall, as well as new loving permanent homes. Our reach for rehoming a dog extends over the Cornish border, into Devon, Somerset and beyond. Have a look around our site, read more about us and how to foster or adopt a dog, view our newsletters, and find out how you can help us with volunteering and donations. Keep an eye on our Events page for ways to support our fundraisers. Follow the progress at our Sanctuary. PLEASE NOTE: LCH is now short 'staffed' (for want of a better word) - Theresa who takes all our calls is now on holiday. Please bear with us, we will be getting to the messages, but it will take time as we have our own jobs within the charity, and will need to cover Theresa's as well. Please remember, we are all volunteers, with work, lives and family as well. Please be patient, we will get there eventually... Thank you! A very special foster home is needed for these two souls, currently in kennels: we have just found out from our vets that Archie, the mastiff, needs major surgery on his back legs. He is just 3 years old... Mojo is bonded to Archie, but hates other dogs, so we are looking for a child free dog free foster home who will see Archie through his surgery. THIS IS NOW VERY URGENT, BEFORE ARCHIE'S LEGS GET TO THE POINT OF BEING UNREPAIRABLE. CAN YOU HELP? Click here to read their full story. BAT EMERGENCIES: We have a telephone number you can call (SW Cornwall only). For further information, especially if you find a bat which needs help, please see our Lead On page. ​Click this link to The Bat Conservation Trust website for info on how to contain an injured or grounded bat. We are looking for experienced homes for some 'exotics' we will treat these beautiful creatures no different in application than any other animal we look for homes for...click here for application via pre assessment form. Home checks do apply. We have some 'older' dogs that we cannot advertise here as they are welfare dogs. ​They are all good with other dogs and would be fine with older children.. BUT they need quieter homes in which to retire.. somewhere where someone is going to be home most of the time, someone to share their sofas with... is that you ??? These dogs deserve some peace in their lives.. something that most have never had ... just because their lives have been filled with abuse and neglect, there is no reason why they can't find peace in their dotage... if you can give an old pooch a retirement home.. please apply using the application form here. Sign up for the next course on Tuesday 23rd April. ​Course starts Tuesday 30th April 2019. See Sit Happens web page for details. 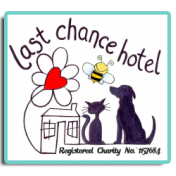 CHANGE A LIFE, SAVE A LIFE.. BE A PART OF LAST CHANCE HOTEL..
Are you an animal loving headteacher? Or do you belong to a group or club that would like a speaker for one of your meetings? If so, our volunteer Carolyn would be very happy to come and give a talk on Last Chance Hotel to spread the word about our work. ​Find out more on our events page. ​These beautiful pooches now have a new life ahead of them! ​Other ways to donate can be found here. Every penny of your donation (including Gift Aid) goes to LCH. You may be charged for your text message, please refer to your network operator's standard rates. If you would like to donate a gift to the animals in our care, our Amazon Wish List is a great way to give something special. 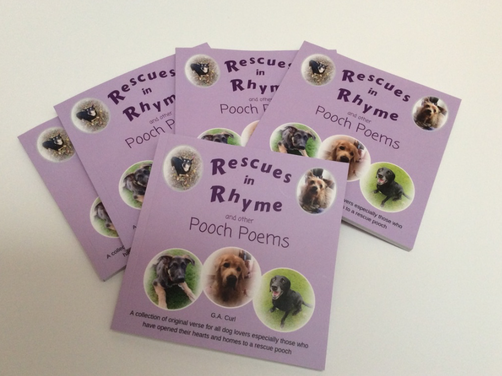 'Rescues in Rhyme and other Pooch Poems' is a little paperback book produced especially to raise funds for LCH. Find out more on our website page here or click the pic. Chunk's Tale is a little rhyming story book for children. It has been written by one of our Last Chance Hotel supporters, Anne-Marie Reed. It tells the story of Chunk, a real dog that was saved by Last Chance Hotel. All profits from the sale of the book are kindly being donated to Last Chance Hotel. You can purchase a copy of Chunk's Tale by clicking here. The Last Chance Hotel Hub Shop is now up and running in Redruth town centre. The Hub is not just another charity shop; it also serves as a community centre for information, advice, and support for all pet related matters. There are goods on sale, new and preloved, and hot drinks and cake in exchange for a donation. Do drop in for a browse and a chat, you will be warmly welcomed! We are open Monday to Saturday, 10am to 4pm. A huge thank you to all our incredible volunteers and the wonderful people who have donated already. If anyone has any quality goods to donate we would greatly appreciate them dropping off to the shop at 83 Fore Street Redruth, almost opposite Wilko's. ​Whether you are visiting beautiful Cornwall or are a lucky resident, great ideas for days out with your pooch, dog friendly beaches, cafes, pubs, places to stay, and some fabulous walks can be found on dogfriendlycornwall.net. Take a look today!